How severe is this upcoming El Nino? Hoping for a beautiful, hot and dry summer here. Also the 2010-2012 La Nina was massive, there were floods in QLD, NSW and VIC. At melb airport we had 300mm of rain in October and November, something I've never experienced. AMO was deeply negative for month of May. 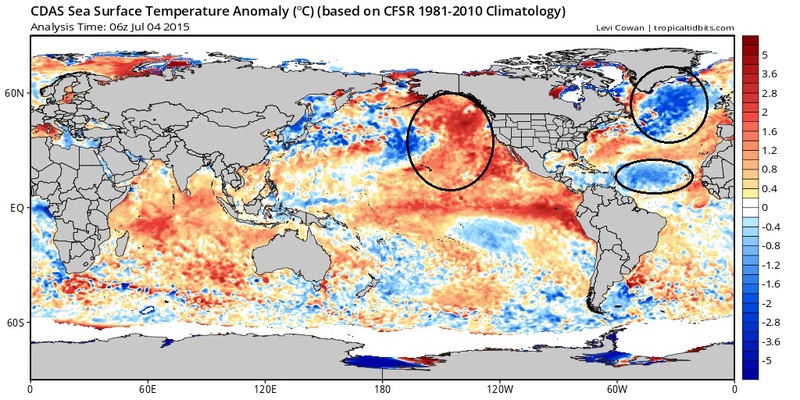 "Switch to colder E. Atlantic (#-AMO) along with warm E Pacific (#+PDO) relates well to wetter US pattern in 2015." If the predicted flip back to negative PDO happens, they can kiss hot weather in the PNW goodbye. I can't wait. It's going to take a lot for it to flip back I think.. It's on fire now.. Would need a lot of Ice Bergs in there.... lol, or someone to start tilling the waters. Which reminds me, have to check the latest on the underwater Volcanoes erupting in the Pacific . Speaking of cold... Notice in the North And South Atlantic, we flipped to below normal... Say goodbye to the Warm AMO phase and hello to the beginning of the Cold AMO phase. This is part reason why the Atlantic has been quiet BUT there is threat in the middle areas still. If we get a -amo, -pdo and a la nina what effects would it bring in the U.S? So this multi decadal negative PDO lasted from 2007 to 2013? What happened to the decades? Joe Bastari is quite confident it flips back to negative PDO in 2016 after this El Niño. I thought we started in the late 1990s? Which would still make for a short flip but would over a decade long. Yeah I think we flip back.. This is probably the long term warming process as it moves into warm phase. Should bounce up & down as its been doing until it just stays warm. Or maybe we never left the warm phase since the 1980s and the cold dips we had weren't really enough to call or a phase. That would mean we been in a warm phase for over 30 yrs though. If you ask me by the looks of your graph it's been far longer in warm phases than cold phases since 1900. Seems to me we should be due for a long negative phase. In fact, many cllimos are talking about the coming cold PDO (when it flips back)and negative amo. Then we are all in for some brutal cold including PNW. In fact the guy you posted about on Weathertrends 360 talks about that very cold period when the PDO flips back and the AMO is cold.